Podcasting is a great medium. It’s fun - for both the creator and the listener. It’s rewarding, in that there’s a wide range of opportunity for brands, entrepreneurs, and individuals to build their authority, promote their products and services, and reach a new audience in a way that’s more intimate than most other online mediums. And, on the surface, it seems relatively quick and painless… after all, unless your listeners are acutely aware of everything that goes into the preparation and post-production of your show - for many listeners, it often seems like hosting a podcast is nothing more than sitting at a computer and speaking into the mic. But, as podcasters and podcast fanatics, or anyone who’s ever recorded an episode or has been a guest on a show, we know that there’s a lot of behind-the-scenes work involved in creating and delivering amazing content to our audiences. One of those behind-the-scenes tasks is writing show notes. Writing show notes for every episode you record is a critical component in podcasting that shouldn’t be avoided, and yet we’ve seen many podcasts that simply write one or two sentences, calling them show notes, and post it on their website with their podcast player. Or worse, we’ve seen shows completely avoid the task all together! We get it. Writing show notes for every episode you record can take up a lot of valuable time - time you could be spending doing other things. 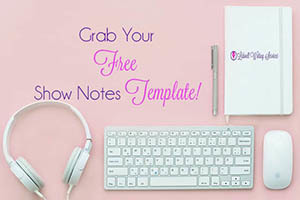 But if you’re serious about improving your podcast, growing your show, and reaching new listeners and subscribers… you need show notes. They are the fuel your show needs to get ranked in search engines - and as we all know, ranking on the first page of Google (or any other search engine, for that matter) will drive more traffic to your website. And traffic often means more potential new listeners, new subscribers, and maybe even new clients. So, this week, we wanted to take a few moments to give you a few tips on how you can take the pain out of writing your podcast show notes. Show notes provide the fuel your show needs to get ranked in search engines. In a previous post, we shared with you our strategy for writing great show notes and one of the tips we shared - if your show has guest interviews - is to ask them to send you their official bio. Having your guests send you their official bio not only helps you make sure you’re getting all your facts right when introducing them to your listeners while recording, but it can also save you a lot of time trying to write your show notes. Of course, you don’t want to use write their bio, word-for-word, in the show notes of their featured interview. It’s always best to rewrite things like this in your own words, but use their bio as a guide to help you maintain accuracy. One strategy we’ve noticed a lot of DIY podcasters (those who prefer to do their own post-production work), is writing down little notes for themselves while they’re recording. You can use things like paper and pencil, or something as simple as Google Documents or Microsoft Word. Regardless of the writing tool you choose, taking notes of key talking-points while you’re recording is a great way to significantly reduce the amount of time it takes you to write your show notes. If you’re the type of person who finds it too distracting to take notes while you’re in the middle of recording your episodes...you’re not alone. In fact, it’s often better if you keep your focus and attention on the conversation - especially if you’re interviewing someone else. In this case, you may want to consider re-listening to your episodes and taking notes then. This will allow you to pause, “rewind,” and replay the episode at any time, just in case you happen to miss an important detail. This is also a great way to find a few juicy quotes you can use in the social media marketing strategy for your episode. Whether you’re recording a solo show or interviewing a guest, chances are you either know the topic content so well you can recite it in your sleep - or you’ve conducted research on your guest and already have a few great questions in mind. Regardless of your podcast format, there are a few ways you can use your pre-planned strategy to make light work of writing your show notes. Newer podcasters often find it easier to find their flow by creating a script for their episodes. This helps them feel more relaxed behind the microphone. If this is you, and you write a script for your episodes, try using the highlight function on your word processor to highlight key points you plan to mention in the episode. Then, later, you can go back to the script and those highlighted areas easily become the bullet point summary for your show notes. If you're already comfortable behind a mic and confident in your presentation skills, you may not need to create a full script. A simple list to help jog your memory on what you want to discuss while recording your show may be enough. If so, then you can simply take that list, write it in a reader-friendly, enticing way, and use that as your bullet point summary. As mentioned above, if your show is in an interview format, it’s likely that you already have a few questions bubbling in your mind that you want to ask your featured guest. If so, writing those questions down can make easy work for you later when it’s time to write your show notes. Simply take those questions, slightly reword them, and use them as your bullet point summary. Need help planning your show and creating a powerhouse podcast strategy? Grab our free Podcast Production & Scheduling Tracker! Writing show notes for many people may not be the most exciting part of being a podcast host, but with careful planning and a reader-friendly show note structure, they can be the difference between having a slow-growing show and having a one that grows at nearly lightning speed. Don’t overlook the power of SEO. Use it to your advantage by writing amazing, SEO-friendly show notes for each episode you produce! For more tips, tricks, and strategies on how to grow your show, write show notes, and podcast like a pro, subscribe to our newsletter or follow us on social media!